Major Technological Advancements Deliver Enhanced Performance, Connectivity and Value. Bluesound, the leader in wireless, high-res, multi-room music systems, announced Bluesound Generation 2i (Gen 2i), building on the success of the brand’s previous platform. 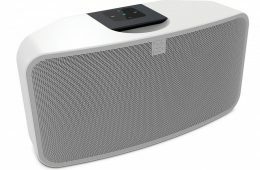 Bluesound, the leader in wireless high-res multi-room music systems, announced the availability of the FLEX SKIN for their affordable PULSE FLEX speaker. The Bluesound PULSE Soundbar and Subwoofer are the latest products from the Lenbrook Group’s wireless speaker company. With much of our media consumption coming from streaming services, cloud storage, or our own local digital storage, wireless streaming speakers have become quite popular. Bluesound and competitors like Sonos seek to provide an ecosystem in your home for consuming media via their wireless amplified speakers.